Assalamu Alaikum, this is the 3rd part of the 90 good deeds series to welcome the holy month of Ramadan……It’s a wonderful opportunity to prepare our children to practice doing good deeds in this month and in any other time of the year. 1- To raise the child’s awareness of the importance of the months that precede the month of Ramadan and counting down to its arrival. 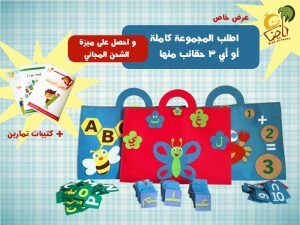 2- To help the child understand the Hijri months to eases the memorization of the Islamic months. 3- To be spiritually ready to welcome the holy month of Ramadan by doing good deeds frequently and turning it into a lifetime habit. 4- Reinforce the concept of worship (Ibadah) in the child’s daily life during the month of Shabaan. This program is suitable for children in the age between 6-12 years old. It consists of ninety tasks or activities for three months….90 days…. it will be divided into three parts. The 3rd part will start at the beginning of the month of Shabaan. 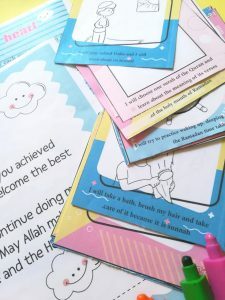 • Good deeds cards which are different from the cards in part one…..some of it are acts of worship and kindness and some to strengthen the relationship between the child and the people around, such as family members, relatives, friends, neighbors…..etc. All these cards are derived from our beautiful deen al Islam. These are represented it through exciting and interesting illustrations, so children can learn and have fun at the same time inshaAllah. I would like to thank sister Marwa Bayazeed for the lovely illustrations she did for these cards. 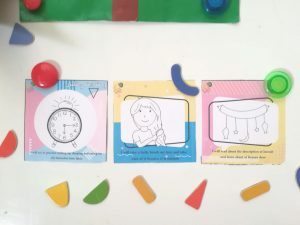 • We also included a countdown chart to follow up with the task mentioned in each card. • Certificate of Completion for the last and third part of this program for boys and girls. 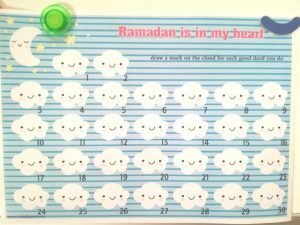 1- Start at the beginning of the month of Shabaan and print out all the cards. 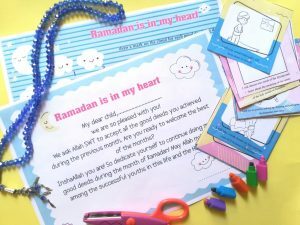 2- Create an atmosphere of excitement by reminding the child about the arrival of a very special guest which is the holy month of Ramadan. 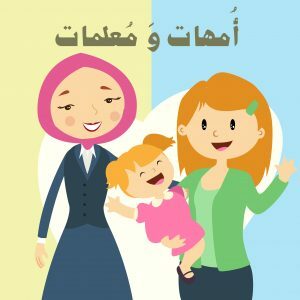 3- Involve the child with the preparations physically and spiritually by acknowledging that we do not only get the house ready to welcome the special guest or purchase new Eid clothing, but also prepare ourselves by doing good deeds and acts of kindness too. 4- Assign one daily task for your child to finish and color the specific number for that day in the chart below. For example: the1st day 30….2nd is 29, until you count down to Ramadan. 5- Motivate your child by constantly reminding them that doing these tasks will earn him the pleasure, rewards and love of Allah SWT. The file was translated to English by :(Hadia Shukairy ) and (Bayan Tohmaz) jazakom allah khairan.